People usually wonder why Taj Palace Hotel grasps so much attention. The secret behind it is that this accommodation facility has got some of the finest restaurants in the town and one of them is Topkapi Restaurant. 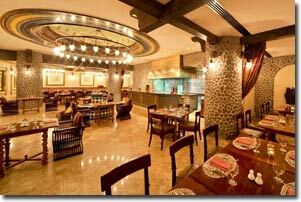 This fine dining restaurant offers fine assortment of lip smacking Turkish and Arabic cuisines along with soft drinks. People from different corners of Dubai come here to bask in its top specialties like shish taouk, grilled kofta kebab and lamb chops from its a la carte menu together with daily changing specialties. Relaxed ambiance and efficient service by the staff of Topkapi makes it an outstanding venue that will force you to revisit this bistro time and again. In this exclusive bistro, food lovers of Dubai get to eat delicious Turkish and Arabic dishes. These cuisines are prepared fresh each day in the open kitchen of this eating place that gives an interactive element to dinners. Quality of their food can be judged from the tenderness and freshness of its meats which can satisfy even a finicky appetite. Grilled fish is the top of the line dish of this eatery. Desserts of this venue are also amazing therefore keep some room for them too when eating food at this restaurant. Aside from food this restaurant also serves shisha to its valuable customers. Topkapi opens every day for lunch and dinner. Its operational hours for lunch are from noon to 3:30 pm and dinners can be relished between 7:00 pm to 11:30 pm. Taj Palace Dubai, Al Rigga - Dubai - United Arab Emirates. Head southeast on Al Rigga Road towards Abu Baker Al Siddique Road/D 78, then make a slight right turn onto Abu Baker Al Siddique Road/D 78 and afterwards at the roundabout, take the second exit onto Al Maktoum Road/D 89 where you can find your destination on the left side. 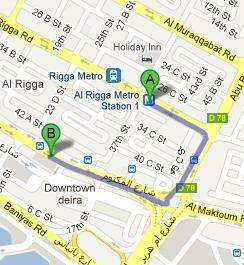 Clock Tower Roundabout 1 – Dubai is 2 minutes walk from Topkapi Restaurant, as it is 130 meters far away from this eatery. So bus users need to take any of these bus numbers 4, 11A, 27, 53, 64A, C1, C4 and C5 in order to get to Clock Tower Roundabout 1 – Dubai, from where they should head west on Al Maktoum Road/D 89 to reach the destination on the left side. Checkout map for directions.